Valentine’s Day in Las Vegas is just a few days away—so do you have plans on where to go for your Valentine’s Day dinner? We know that a good Valentine’s Day is about more than chocolates and flowers, it is about having a great meal and sitting down with someone you care about. Here at Hearthstone, we know that Valentine’s Day is a big deal for married individuals, casual couples and everyone in between, and that you want to not only spend it with someone you care about, but that you want to actually enjoy the dinner you sit down at. 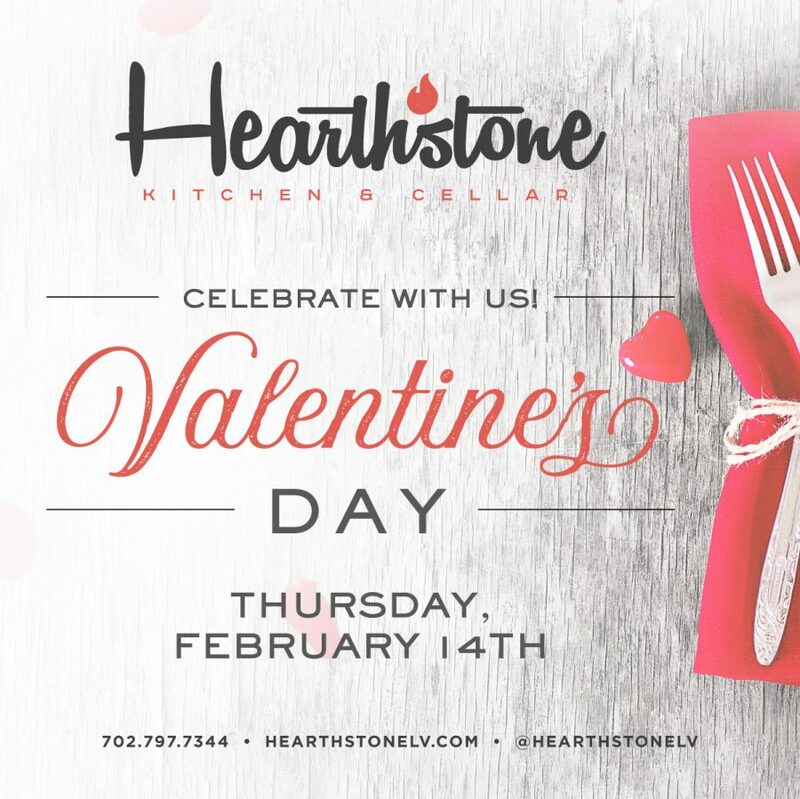 This is why there is no better to celebrate Valentine’s Day in Las Vegas than Hearthstone Kitchen and Cellar. Chances are, you already know how delicious Hearthstone’s normal menu is, but we are really stepping up our game with Valentine’s Day this year, and offering a special one-night only menu that is perfect for the year’s most romantic holiday. You can make RESERVATIONS HERE! Here’s what is on the menu for our Valentine’s Day menu event. Start your evening off with everyone’s favorite aphrodisiac. We are serving oysters on the half-shell served with Tobiko Vacia, scallions and Ponzu sauce. It is a great blend of flavors and a delicious way to kick off any meal. We have two specialty entrees available for Valentine’s Day. The first is our seared scallop. It is made with a Parsnip Puree, shallot and bacon chutney and red watercress. We also have the Surf and Turf for Two-the perfect fish for sharing. This 24 oz. Dry-Aged Ribeye is served bone-on and bursting with flavor. The meal also comes with Brussle sprouts and a Bearnaise Sauce. No Valentine’s Day dinner celebration is complete without a dessert. We have White Chocolate Pavlova available which is complete with a Berry Pomegranate Compote. You can enjoy all of these great dishes right here at Hearthstone on Valentine’s Day. However, remember, our specialty Valentine’s Day menu is only available on Thursday, February 14th. This is the only time you will get to enjoy our specialty menu, and it won’t be around long. Call today at 702-797-7344 to make your reservation for Valentine’s Day and enjoy one of the best meals in the city with someone you care about.